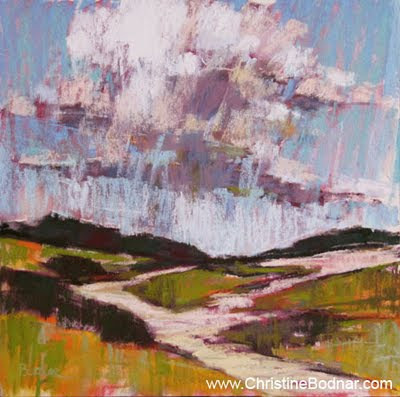 Bio: Boston artist Christine Bodnar has worked in all media but pastel painting is her medium of choice. She received her B.A at Central Michigan University in 1982 with a studio major in painting and subsequently attended the Massachusetts College of Art and the School of the Museum of Fine Arts in Boston. Her artwork has been selected for exhibition in many national and international juried pastel exhibits, and she has received awards from numerous art associations and publications, including the International Association of Pastel Artists and Artists Magazine. 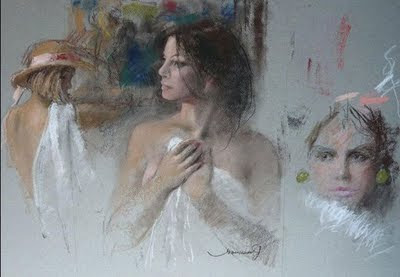 In May 2011 she was awarded Master Circle status from the International Association of Pastel Societies. 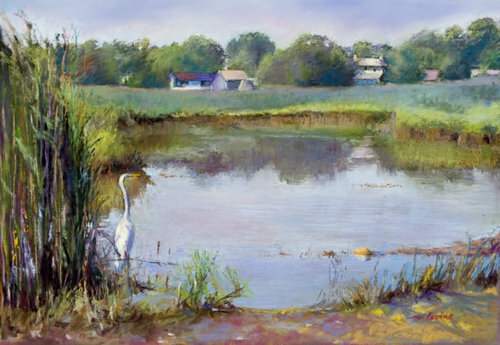 Christine does much of her painting on the southern shores of Massachusetts, where, she says, there is always something to stimulate the artist's palette. Navigation: All links remain available on page. Gallery: Paintings: Five (not four) pages of thumbnail images. Image View: The thumbnails yield up their title and dimension if you rest the cursor on them. They enlarge in a slide viewer, and may be saved. Chance of Rain is 10 x 10 ins. Bio: Kathleen Galligan graduated in 1972 from Wilson College, Chambersburg, Pennsylvania with a B.A. Fine Arts, and in 1979 from Philadelphia College of Art with a B.F.A. Honors. llustration was her focus of study at Philadelphia College of Art, and although she preferred to take the route of painting as a career, Kathleen has from time to time indulged in illustration projects, including archaeology. A recent publication was the cover painting and design for her husband, Dr. Warren Riess' book Angel Gabriel: The Elusive English Galleon, (ISBN 0-9713438-0-2 ) the history of and search for the remains of a seventeenth-century ship, built for Sir Walter Raleigh’s last expedition to America in 1617. Kathleen has been exhibiting her work in Philadelphia, New York and Maine since the early 1980s. She switched from oil to pastel after taking a workshop with Albert Handell. She was granted a one month residency at the artist’s colony, YADDO in Saratoga Springs, New York and later a two week residency in Acadia National Park, in Maine. An article about her work was published in the February 2008 issue of The Pastel Journal, and in 2010 Kathleen was included in the international artists section of the pastel edition of French art journal, Pratique des Arts. Her work is in the collection of the Farnsworth Art Museum, Bates College Museum of Art and in many corporate and private collections worldwide. Medium : Pastel, oil. For pastels, Kathleen works on Ersta or Wallis sanded papers, blending the softest of pastels – Unison, Schminke, Sennelier, Daler-Rowney – to create her luminous, atmospheric pieces. Style: Sometimes representational, lately more impressionist. Gallery: Recent pastels; Recent oils; Selected work – Grand Canyon, Plein Air, European, A Few Favourites. Image View: The images may be enlarged and viewed serially by using the “next” button. Curiously, there is no “back” button, if you wish to view a preceding image. Images may be saved. Spring Migration is 9 x 17 ins, 504 x 223, 33.8 KB. Bio: Marge Levine graduated from the Fashion Institute of Technology in New York City with a degree in textile design. She also studied at the Brooklyn Museum of Art, The Art Students' League of New York, and the Cambridge Art Association in Cambridge, England. She has also worked as a book illustrator, greeting card designer, and etcher. She is a member of the Degas Pastel Society, The Pastel Society of America, and the Pastel Society of Cape Cod. 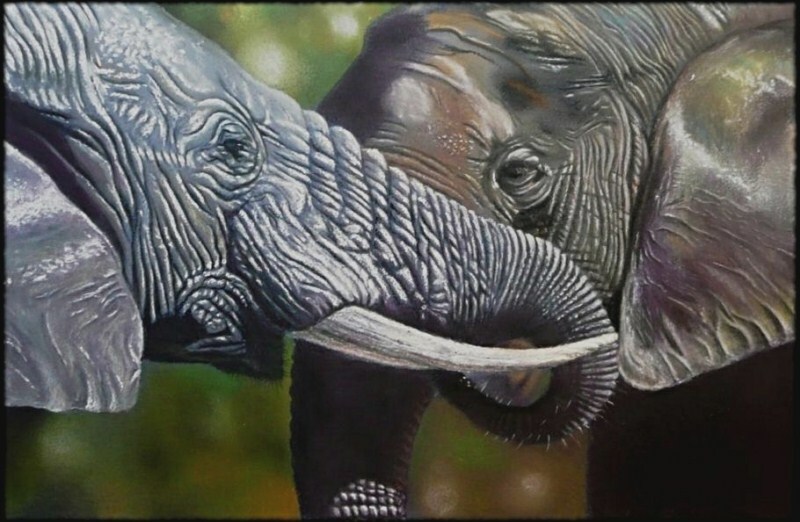 She is a recipient of many prizes for her work, not only in pastels but also in other mediums. Her work has been shown in exhibitions across the United States and Canada, has appeared in the volume One Hundred Ways to Paint the Landscape, and was showcased in the April 2006 edition of American Artist magazine. Marge currently reside in the Atlantic Highlands, New Jersey. Subjects: Landscape, especially en plein air. Navigation: The main menu remains available on the side. Image View: The gallery navigation is a little unclear to me. Best to click on the first image to enlarge it, and then proceed along the rest of the paintings. The “next” button is missing at painting no. 9 – just click on 10. Details of size are included in the notes, and the images may be saved. American Egret is 11.25 x 16.5 ins., 500 x 345, 60.6 KB. Bio: Patrick Hedges was born in Kampala, Uganda, and lived for 14 years in and around East Africa. This early childhood instilled in him a love of wildlife and the outdoors. His description of his life at home sounds like an African version of My Family and Other Animals by Gerald Durrell - from a bedroom full of live snakes to 40 dwarf toads in the bathtub. 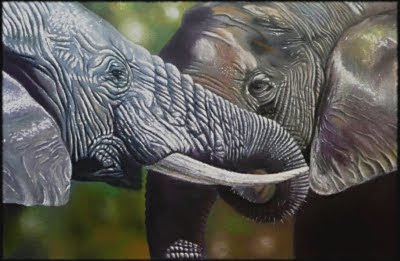 Patrick and family moved to England in 1974 after his father died, but he soon developed a severe case of wanderlust, and when he started to develop his skills as an artist, it soon became evident that his subject matter was always going to be wildlife. Nowadays Patrick Hedges lives in Adelaide, South Australia, with his wife and children. Medium : Scratchboard , pastels, acrylic, oil, pencil. Style: Realistic and detailed renditions of his subjects. Navigation: The website is a blog. Image View: Each gallery consists of thumbnails that enlarge when clicked. The size of the original is not noted, but the enlargements may be saved. Blog: This site is a blog. Demo: Yes – go to the art blogs for serial development of paintings. Bio: The late Catalan painter Joan Marti Aragones was born in Barcelona in 1936, during the Spanish Civil War. At thirteen years of age he was admitted as an apprentice to the studio of Nolasc Valls. Marti showed a predilection for Figurative Art from the start and enrolled in the School of Fine Arts in Barcelona, whence he graduated in 1959 with a BFA. After completing his studies he won a scholarship to further their studies in Italy and America. At twenty years of age, Marti had his first solo exhibition. Six years later, and after a deep reflection on his painting, he had his successful second exhibition, this time in the Gallery Jaimes in the famous Paseo de Gracia in Barcelona. In 1986 he moved to Rome, to the Cinecitta film studios, where the film Othello was shooting, and with full authority from director Franco Zeffirelli, took notes on Placido Domingo, Katia Ricarelli and other actors. Martí completed 25 works on the theme of Othello with Placido Domingo as the main model for a traveling exhibition which went worldwide in 1992. From then he held exhibitions in the major Spanish galleries, and throughout the world. Joan Marti passed away in February, 2009. Medium : Oil, Pastel, Watercolor, Graphite. Style: Representational. Of his figurative painting, the critic Josep Pla said that it was full of "practical realism, almost magical, extremely intelligent and enjoyable." Navigation: The website is nominally in Spanish, Catalan and English, but only the Catalan links are active. Gallery: Cuadros (Paintings) – Cuadros en venta (Paintings for sale) – Galeria 01; Galeria 02; Galeria 03. Image View: Each gallery consists of thumbnails that give information on title, size and medium if you rest the cursor thereon. The majority are in oil, but there are some pastels. Clicking on a thumbnail opens a larger image on a new page – this image may be saved.